How much water does my trail horse or mule need? As the weather continues to stay hot (and even gets hotter), it becomes more important to monitor the amount of water your stock takes in. On a trail ride or pack trip, you should water your stock every chance you get. I try to get to a water source every couple of hours at a minimum during the summer heat, with unlimited water offered overnight. An average horse or mule requires around 10-13 gallons on a normal day. The amount needed will increase in hot weather and will be substantially higher when the animal is working hard. Like humans, horses sweat to cool down, and will need to replenish those lost fluids. Plan ahead. Water is often not available at the trailhead. Pack water from home so that you can offer it both before and after your ride. This is also good for picky drinkers, so you are guaranteed that they have something familiar. Portable water tanks are great for this, but you can also use clean garbage cans or 5 gallon buckets with lids. Also, don't rely solely on your map to determine water sources during the ride, as creeks may dry up or water may be nearby but inaccessible. Double check both grazing and water availability with local rangers or fellow riders that have been in the area recently. Carry a collapsible water bucket with you on the trail. Some areas have restrictions that do not allow stock to approach the water source, or the footing may be unsafe. If you come to a stream that you cannot walk down to, you can attach a rope to the handle to lower the bucket into the water. Allow the bucket to fill, and lift it back up to you. It's always a good idea to have a good, sturdy length of rope with you on a ride, whether it is for picket hobbling, setting up a highline, or hanging food in bear country, but even reins or lead ropes can be used in a pinch. I highly recommend watering the animals at home with the bucket prior to the trip so that they are used to it and recognize it as their own. Stop and wait! When you reach a watering spot, make sure all animals have drunk their fill before anyone continues riding up the trail. 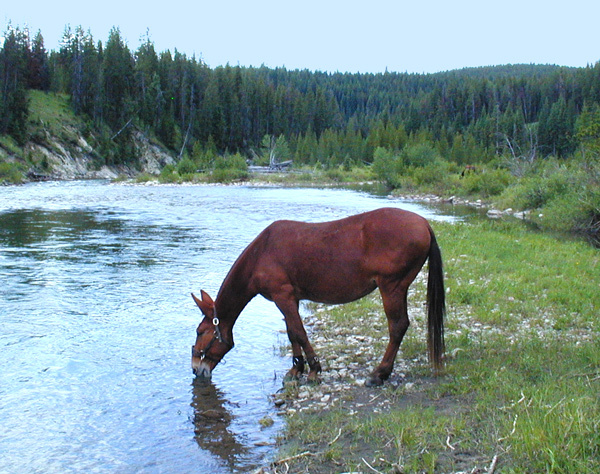 Horses and mules are herd animals, so they will skip a much needed drink if they feel that they might be left behind. Always provide water at mealtime. If you are feeding dry hay, cubes, or pellets, it is essential to have plenty of water available to prevent impaction colic. Another easy way you can supplement water intake is to soak the feed until well saturated before feeding. It's also a good idea to alternate smaller portions of food with water, rather than feeding the entire meal at once. Clean, uncontaminated water is a must. Moving water from creeks and lakes is always preferable to water found in stagnant ponds and bogs. Often, horses will refuse to drink if they can smell any contaminants, even to the point of dehydration. Unlike dogs and humans, horses are unable to vomit. If horses are forced to consume water that is contaminated with dirt, algae or manure/urine they may become very sick. Finally, it is a myth that you should withhold water from stock after hard work. You should allow the animal to drink a little, walk for a few minutes, and repeat until the horse is no longer interested in the water and the heart rate has returned to normal. The availability of water is just as important a consideration as the trail conditions, grazing options, and good fishing holes. Plan ahead, take care of your stock, and you should have an enjoyable, safe trip.